Eating about one serving of meat daily puts ethnic Chinese adults at increased risk of diabetes, a study here has found, echoing research that has mainly been conducted on Westerners so far. The study, which tracked 45,411 people from 1999 to 2010, found that a median daily consumption of just one palm-sized serving of meat increased the risk by 23 per cent for red meat and 15 per cent for poultry respectively. The culprit is the dietary haem iron content found in meat and poultry, said the senior author of the study, Professor Koh Woon Puay of the Duke-NUS Medical School. Red or dark meat, such as beef, mutton and pork, contains a higher amount of myoglobin protein, which carries haem iron for binding oxygen. Haem iron is more quickly absorbed by the body, but excessive amounts can damage tissues such as those that produce insulin in the pancreas. The more myoglobin, the higher the haem iron content, the darker the meat. Some parts of chicken, such as the thigh, are also considered dark meat. While haem iron is found only in meat, poultry, seafood and fish, non-haem iron is found in both meat and plant-based foods like dark green vegetables, nuts and seeds. Red meat is beef, lamb or pork. However, the concentration of myoglobin in pork is not as heavy as compared with beef. The higher the myoglobin concentration, the darker the meat. Chicken has a mixture of dark and white meats. Breast meat and the wings are considered white meat, while the thigh is considered dark meat. Duck is also a type of dark meat. Fish is mainly white meat. What is haem iron? How is it related to diabetes? While iron is an essential mineral, having a high intake of iron in the diet in the form of haem iron has been shown to have adverse effects. While insufficient iron in the body can result in anaemia, absorbing too much in the form of haem iron can lead to oxidative stress, damaging tissues in the body, especially the beta cells in the pancreas, which are responsible for the production of insulin. This in turn results in difficulty in regulating blood glucose levels. Haem iron is easily absorbed and too much can accumulate in the pancreas and liver, while absorption of non-haem iron is regulated by the body. The Duke-NUS study is of Chinese Singaporeans and permanent residents aged between 45 and 74 years when they were recruited between 1993 and1998. They were interviewed twice about their diet using a questionnaire that covered 165 food items, including 33 that had meat. The large-scale cohort study seeks to determine the impact of dietary and other environmental factors in common chronic diseases such as cancer and diabetes among the Singapore adult population. Factors taken into account included total food intake, smoking status, alcohol consumption, body mass index, physical activity, history of hypertension, and adherence to a diet high in vegetables, fruit and soya bean products. Out of the 45,411 participants, none of whom had diabetes at the start, 5,207 were found to have diabetes after 11 years of study. The average meat consumption in Singapore is 97g a day and Prof Koh said cutting down one's intake of meat was a good step to take. "We don't need to remove meat from the diet entirely. 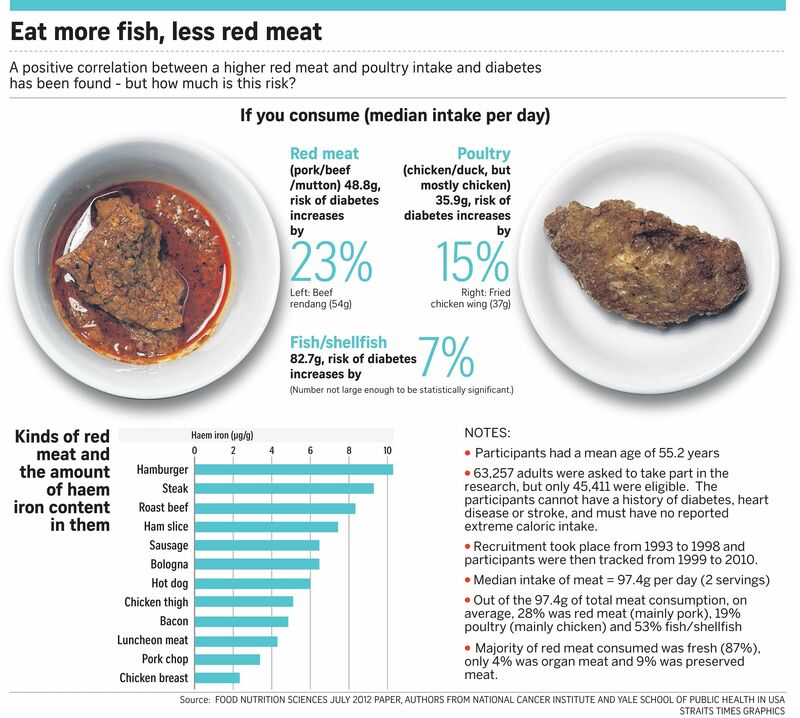 Singaporeans just need to reduce the daily intake, especially of red meat, and choose chicken breast, fish or shellfish, or plant-based protein food and dairy products to reduce the risk of diabetes," she said. Similar findings have been reported in Western studies, but this is the first representative study in South-east Asia. A Harvard study in 2011 showed that a daily serving of red meat increased the risk of adult-onset diabetes by 19 per cent. Though other ethnic groups were not included in the study, Prof Koh predicts a similar result. Dr Annie Ling, director of the Policy, Research and Surveillance Division of the Health Promotion Board (HPB), said: "These findings affirm HPB's recommendation to consume red meat in moderation, and that a healthy and balanced diet should contain sufficient and varied protein sources, including healthier alternatives to red meat such as fish, tofu and legumes."